Tamashii Nations 2016: S.H. 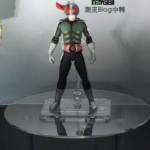 Figuarts Shinkocchou Seihou Kamen Rider Reveals, Rider 1, Skull & More! Frankly each of these figures looks incredible and greatly benefits from the Shinkocchou Seihou renewal treatment. The biggest reveal of this grouping is of course Rider 1, whom many have hoped would receive the premium style treatment we see here, for years. This is certainly an exciting lineup of figures to see at this years event. We look forward to being able to bring you more information and images of these figures as Tamashii nations 2016 continues!